Pale Touch-me-not, Impatiens pallida Nutt. Pale touch-me-not is an erect native annual. Stems are succulent, somewhat translucent, 3 to 6 feet high, easily broken, branching occasionally. Leaves are thin, egg shape with coarse broad teeth and slender long stalks. The inflorescence is a cluster of up to 3 flowers that rises from the leaf axils. 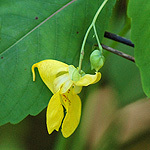 Flowers: Pale touch-me-not has two types of flowers - chasmogamous, which open for fertilization and cleistogamous, which do not open and self-fertilize. The chasmogamous has 1 to 1-1/4 inch inch long flowers hanging on a long drooping freely moving (pedicel) stalk and the flowers have a curved nectar spur at the back end that curves downward and sometimes then forward. This spur is shorter than that on I. capensis which curves forward more. The stalk has a small ovate to lanceolate shaped bract in mid-stalk. 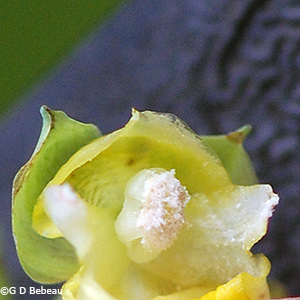 The flower stalk is attached just above the mouth of the corolla where one petal and three sepals come together. Flowers have 5 petals that seemed fused together in places, forming the upper lip projecting out like a hood, two laterals and two larger lower lips which flare outward. There are 3 sepals, with the larger forming the cone of the back of the flower and the nectar spur and showing itself at the base of the corolla between the two large lower petals; the other two are a much lighter color and seen on the top of the corolla behind the upper lip. Five stamens with white anthers are united around the single pistil and the assemblage is tucked up under the upper lip. The flowers are dichogamous, that is, with the male and female parts maturing at different times, thus avoiding something nature does not like - self pollination. The male parts are ready first and the anthers are ready for pollen release for only a twenty-four hour period, then the anthers are dropped and the female stigma is exposed. The receptive phase then follows when the stigma can receive pollen but that phase is very short - average of four hours according to experiments that have run. The cleistogamous flowers are found singly in the lower leaf axils and require only three weeks to mature. These are usually produced later in the season. These are only 1 to 2 mm in diameter. These flowers produce seed when, through stress or other climatic conditions, the regular open flowers are few or cannot be pollinated. Also, since the type of pollinator required for the open flowers, due to its deep nectar sac, is quite limited, and also since the plant is an annual, cleistogamous seed production insures that the species will re-seed. The fruit is a pod that when mature will explode and expel the seed some distance - hence the common name of "touch-me-not" (see Thoreau's notes at bottom of page). Seeds are longer than wide, brown with lighter ridges and usually number 3 to 5 per pod. The cleistogamous flowers also form seed pods but contain fewer seeds. Hummingbirds and large bees are the prime pollinators. By inserting a hummingbird's long tongue into the curved nectar spur, the spur is pushed away with each lick of the tongue and then the spring-like action of the pedicel brings the flower back toward the bird causing the anthers or the stigma to contact the back portion of the birds bill, thus transferring pollen. [see Mobility of Impatiens capensis flowers: Effect on pollen deposition and hummingbird foraging by Hurlbert, Hosoi, Temeles and Ewald, Spring 1996 published in Oecologia.] For details on the mechanism that releases the seeds explosively, see this article. 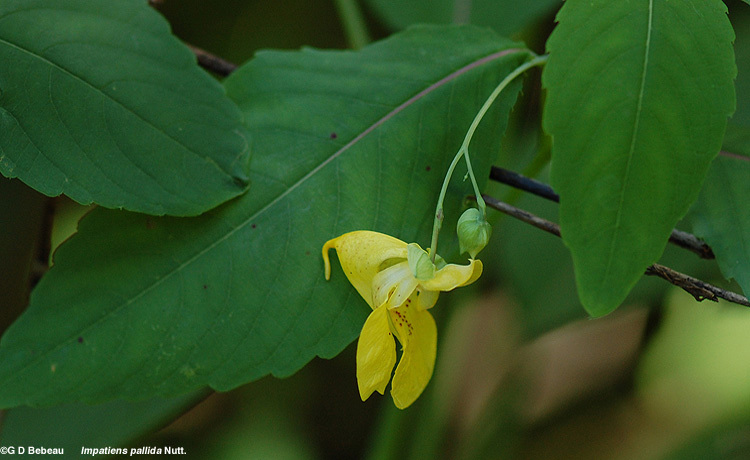 (pdf) Another article that covers in detail the research on the open and closed flower types in this species is Jewelweed's Sexual Skills, by Donald M. Walker, University of Wisconsin, in Natural History, Vol. 91 #5. and also papers in Evolution, Vols. 34, 38, 41. While all articles deal specifically with I. capensis, the methods are the same in I. pallida. 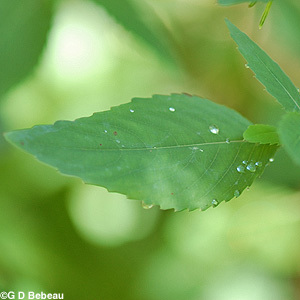 Habitat: The Jewelweeds are plants of deciduous woods and moist places with full to partial sunlight, although this species seems to prefer only partial sunlight. They are true annuals. Because of this their abundance varies from year to year - and they are found only in moist areas of the Garden during drier years, otherwise they can grow in drier soils with adequate rainfall. Names: The genus name impatiens is Latin for "impatient" referring to the characteristic of the seed to explode from the dry seed head. The species name pallida refers to "pale", the color of the corolla. The author name for the plant classification - ‘Nutt.’ is for Thomas Nuttall (1786-1859) English botanist who lived and worked in America from 1808 to 1841. On his many expeditions he collected many species that had been originally collected by Lewis and Clark but lost by them on their return journey. The alternate old common name “Wild Balsam” is derived from the Latin family name for the species, BALSAMINACEAE. Comparisons: Pale Touch-me-not has pale yellow flowers with few spots. The spur on the back bends at a right angle downward, but usually not very far underneath the corolla and not far forward but not then upward like the Spotted Touch-me-not, I. capensis, however, the position of the spur will vary depending on the maturity of the flower. Flowers are also larger than I. capensis. Both the Spotted and the Pale Touch-me-nots are in the Woodland Garden but the Spotted is much more prolific and invasive. At the end of summer the spotted can be seen all over the marsh area in certain years. Above: 1st photo - Two of the three sepals are very small yellowish-green leaf-like objects (one visible above) above the upper lip. The third sepal forms the large yellow cone of the back of the flower. 2nd photo - The five petals are visible here - The upper projecting lip, two small less colorful petals just below the upper lip and two large yellow petals forming the wrinkled lower lips. Note also, the small bract on the leaf stalk. Below: 1st photo - A typical egg shaped leaf with broad teeth. 2nd photo - There are five stamens with white anthers that are united around the single pistil and tucked up under the upper lip. The two greenish-yellow sepals above the upper lip are visible here. Below - Touch-me-not seed dispersion: 1st photo is the seed capsule approaching maturity. When the capsule is ready, touching it with slight pressure will cause the plant material inside to suddenly form a twisted coil (2nd photo ) and disperse the seeds to quite a distance. Notes: Pale Touch-me-not is not indigenous to the Garden. Eloise Butler's Garden log indicates she secured some of these plants from the river bank near Fort Snelling on May 6, 1913. It is native to Minnesota in the SE, some Central counties and counties along the north side of the Minnesota River. In North America it has a much more restricted range than I. capensis, and is a species of the eastern half of the U.S. and Canada. The only two species of Impatiens native to Minnesota are I. capensis and I. pallida, Pale Touch-me-not. Toxicity: I. pallida is not known to have toxicity problems like Spotted Touch-me-not. 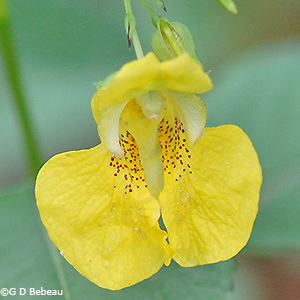 Eloise Butler wrote of Jewelweed: "Every inch of space on low, moist soil not held firmly by tufted meadow grasses and sedges is occupied by the Wild Balsam. The smooth, glossy stem has a translucent appearance, and its joints are swollen, affording another proof, of course, that rheumatism is induced by dampness! The leaves are thin and delicate. When dipped in water, their under-surfaces appear to gleam like quicksilver, an appearance due to tiny hairs that catch the water and enmesh air bubbles. The hairs keep the pores that are abundant on the under side of the leaves from being clogged with water. Some water beetles show the same phenomenon when they dive; but, in their case, the air bubbles supply them with the requisite oxygen during the period of immersion. Little girls are familiar with the plant as Jewelweed. By means of the curved nectar spur, they hook the flowers in their ears and are fine ladies, for the nonce, with gold ear-drops. 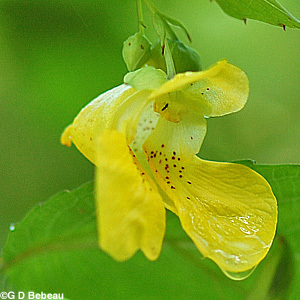 The most common species of Balsam has flowers usually spotted with brown, of varying shades of orange and yellow, and sometimes pink or white. This is called Impatiens biflora. I pallida has larger, pale yellow, often unspotted flowers, with stouter spurs. The term Impatiens refers to the nature of the seed-vessel, the origin of another common name, touch-me-not. If you gently press the plump, ripe seed-pod between your thumb and forefinger you will be startled by its breaking up into writhing, worm-like pieces, and by the seeds snapping out several feet into space." Published Aug 20, 1911, Minneapolis Sunday Tribune. Thoreau wrote in his journals: "Touch-me-not seed vessels, as all know, go off like pistols on the slightest touch, and so suddenly and energetically that they always startle you, though you are expecting it. They shoot their seed like shot. They even explode in my hat as I am bringing them home."